Oasis Metal Manufacturing LLC produces the finest standard gratings in Dubai. Our products have been installed in industries across the UAE and around the world. Gratings are steel bars that are forged to create a grid. Steel gratings have for long been the most favored choice of all gratings types owing to its durability, low maintenance costs, easy to install and customize and long life. We provide gratings manufactured from mild steel or stainless steel with various combinations of load bar depth and breadth. Standard gratings are typically available in 6m x 1m or 20′ x 3′ panels. They can be produced with almost any combination of pitch size. Most commonly this is 41mm x 100mm or 30mm x 100mm. 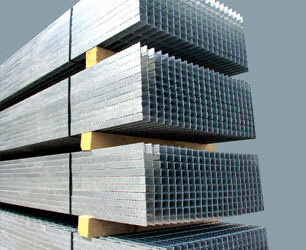 Load bearing bars of width 20mm to 100mm and thickness 2mm to 10mm can be used. Bars can be plain or with a serrated edge finish of various depths. Panels are available self-color or with a galvanized coating to international standards. Mild Steel gratings with a galvanized finish are the most commonly used gratings for the majority of grating applications as they provide high strength and durability even in corrosive environments. Stainless Steel Gratings can also be utilized in all applications where pressed steel gratings as they are manufactured with the same dimensions as galvanized pressed gratings. Stainless steel gratings with a galvanized finish are an excellent material for the most corrosive environments. They are commonly used in chemical applications, breweries, swimming pools and sewage treatment works. Standard gratings are further perfected with Surface and treatment finishes to intensify the slip resistant and anti- corrosive characteristics of the gratings. Surface Finish: Steel gratings are available with a plain or serrated surface. The serrated surface consists of a chain of notches on the upper surface of the load bar; these notches make the grating a non-slip surface to tread on. Treatment Finish: Standard Gratings that are hot dip galvanized are also available. Galvanizing Gratings makes them ideal for use in corrosive environments. It protects the gratings from rust and prevents corrosive substances from coming into contact with the steel. Gratings are also provided in Self color or painted. Low Cost: Standard Grating requires fewer materials and labor force for its construction and can be constructed in a very short period of time. The steel grid requires little cleaning and maintenance. The Low maintenance costs of standard steel and stainless steel grating are a huge benefit to industries. Weather Proof: Standard Gratings are weather proof and are resistant to the elements of nature and can provide the same durability even in harsh environments. Durability: Gratings that are galvanized can resistant to corrosive substances and hence have a long life. Aesthetic Appearance: Steel Gratings allow light and air to pass through. The galvanized or painted finishes provide a modern and tidy appearance. Easy to install: Standard grating does not require many workers for the installation process, the gratings can be easily fixed using the pre-installed supports.